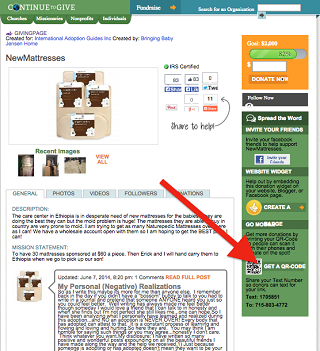 Now, Continue to Give is proud to announce true Text-to-Give functionality! How is Text to Give Different? You may already be familiar with the existing Text to Give with link feature available with Continue to Give. For those of you who are not familiar, it allows donors to text a unique code to a central phone number which texts back a link so the donor can start giving. The donor, then completes the donation form. Running unique identifiers through one phone number is an inexpensive way to offer mobile giving which, in turn, allows CTG to provide a mobile alternative to portal giving at no additional cost to you. Introducing the new Text to Give functionality. With this functionality, a unique phone number is assigned to your Organization or specific fundraising project. The donor registers their phone one time at the time of their first donation. After that they can simply text an amount to donate to your organization, project, or missionary! Login as administrator to your organization's Continue to Give account. In the left pane, select the SMS option and a page of mobile options displays. Note that mobile options are grouped by project starting with the primary organization listed first. Create a Text-to-Give number by entering the organization's area code and click the Search button. A list of numbers to choose from will populate. Select a number of your choosing from the list. If you have multiple projects and would like each project to have its own Text-to-Give number, repeat the steps above for each project. Each text to donate number is specific to each project and your main account. Once the phone numbers have been selected, you pass the phone number along to your donors! First text an amount to the number you created. The first time you will be prompted to register your phone. By making this first donation through the registration process you will donate and a profile will be created on the Continue to Give portal. Once your phone is registered, the Continue to Give system remembers you! Any time you wish to donate to the organization, you just text the amount of the donation and a receipt is emailed to you, a text confirmation displays, and your account is charged for the donation! Donating, tithing, and pledging just got easier! Can I still split donations to multiple projects using the new Text-to-Give functionality? No, you will only be able to make one donation at a time. Each project has a unique number and the funds will be directed based upon the phone number the donor texts to. Does the new Text-to-Give cost extra? Yes, for each phone number you create a $10 monthly fee is billed to your account. We recommend using Text-to-Give for high profile projects generating the donations. Text-to-Give is also great for special fundraisers and events! If I choose not to use Text-to-Give what other Mobile Giving can I use? You don't have to add Text-to-Give to your account. You still have access to the free Text Link feature. In addition, all account/project have the free QR code mobile option and the Giver's App as well. The Giver's App allows for quick donations to your organization through a mobile app and accommodates recurring donation setup and designated giving. 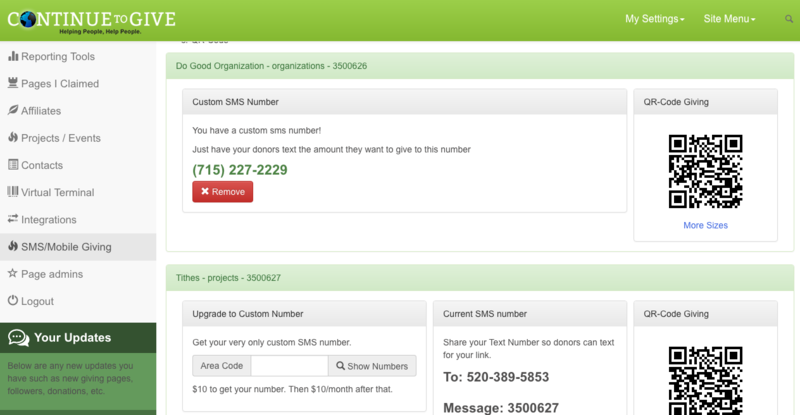 If you don't already know your Continue to Give online giving platform comes with a free text to donate number. You can use this number for anything: print it on flyers, in the church bulletin on newsletters, etc. 1. You can find your text to donate numbers on your dashboard or on your profile page on the right hand side in the green column under "Spread the Word" and "Go Mobile"
3. Once you send the text Continue to Give will respond with your link so your givers can click and give! It's that simple! Don't forget for each profile page you create it has it's own unique Text to Donate number! That means for every project, missionary, and giving page you will have separate numbers to advertise differently! If you need mobile giving sign up for your free account today!